Went vegan, so I need b12 in my diet and B-12 Sublingual 2000 mcg by Source Naturals one is easy to take and taste like candy. My mom and I take Source Naturals B-12 Sublingual 2000 mcg Tablets for energy and nourishment to the brain. Works great for us. I think B-12 Sublingual 2000 mcg by Source Naturals helped me have a bit more energy and these also have the best taste of the tablets from what I've tried. The B-12 Sublingual 2000 mcg 50 Tablets from Source Naturals is a dietary supplement that may help boost Vitamin B-12 in the body. Vitamin B-12‚ also called Cobalamin‚ is a water-soluble vitamin that is essential for brain‚ nervous system‚ and blood formation in the body. It is believed that vitamin B-12 possibly affects DNA synthesis and regulation along with affecting fatty acid metabolism and amino acid metabolism. It has been observed in studies that a good amount of Vitamin B-12 in elder adults may potentially protect brain shrinkage and possibly preserve cognitive functions. It is also believed that a deficiency of Vitamin B-12 may cause damage to the nervous system. 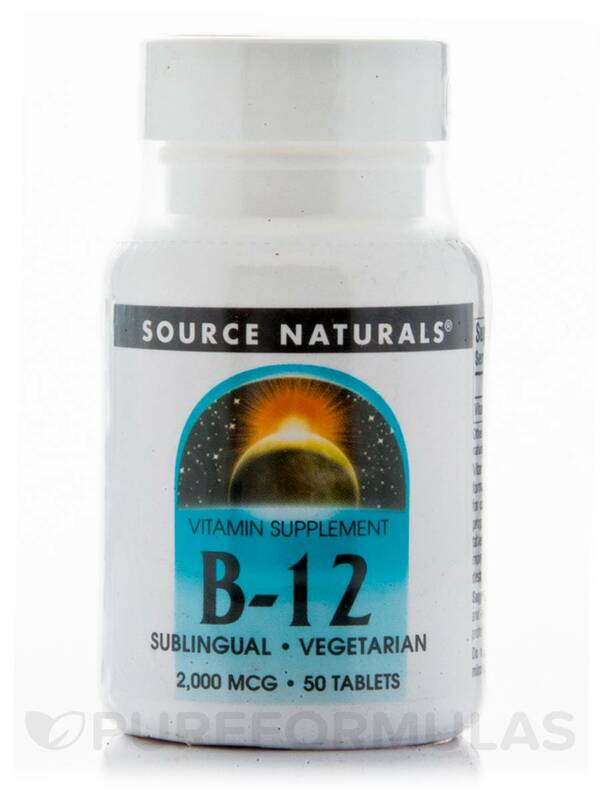 These Vitamin B-12 tablets from Source Naturals could be helpful in giving your body the daily necessary vitamin dose. This vegetarian dietary supplement may also ward symptoms of fatigue‚ poor memory and low mood. 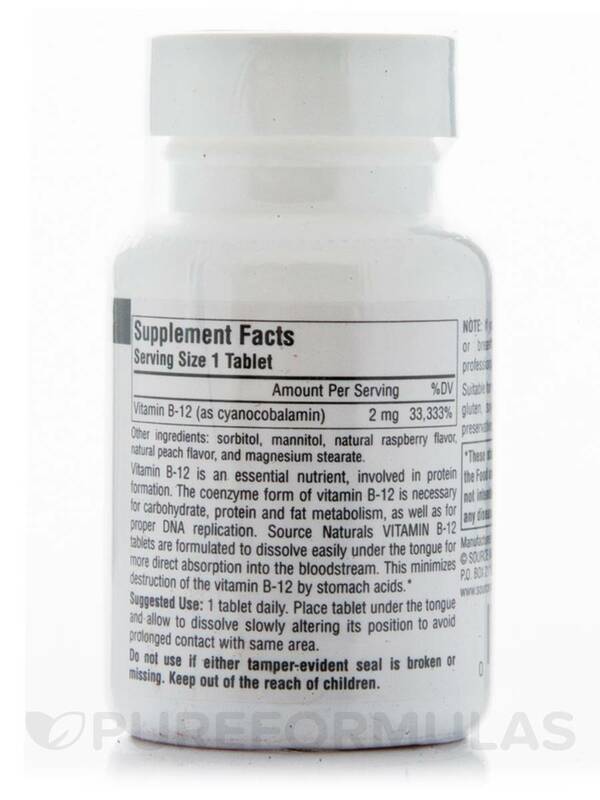 The Source Naturals Vitamin B-12 tablets are prepared in a way that is easily dissolvable under the tongue. This helps in quicker and a more direct absorption of the essential vitamin into the blood stream. This dietary supplement from Source Natural is free of yeast‚ dairy‚ soy‚ egg‚ gluten‚ wheat‚ starch‚ salt‚ preservatives‚ artificial color‚ flavor and fragrances. Get your dose of the B-12 Sublingual 2000 mcg 50 Tablets from Source Naturals and lead a healthier and happier lifestyle. 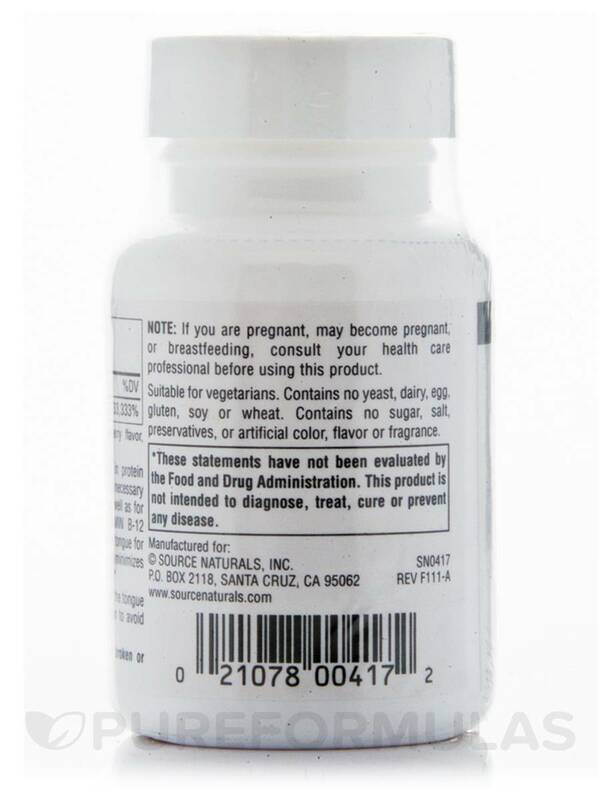 Other Ingredients: sorbitol‚ mannitol‚ natural raspberry flavor‚ natural peach flavor‚ and magnesium stearate. 1 tablet daily. Place tablet under the tongue and allow to dissolve slowly altering its position to avoid prolonged contact with same area. I like this product a lot. I take B-12 in the middle of the day and it makes me feel good. It tastes great to me! This isnt a con necessarily for me but this does take about 2 - 3 minutes to dissolve. The taste is great though so I just eat take my other supps and then have this one last. The Price is Right. Always Free shipping. Reasonable Delivery Time. I like getting my extra B-12 in a sublingual form. I like this brand as the ingredients are natural. The only thing I have an issue with is that B-12 Sublingual doesnt dissolve as fast under the tongue as I would like. The flavor is good though and not too overpowering.